Labour-INT promotes inclusion of asylum-seekers and refugees in the labour market. 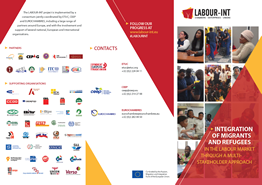 Building on the interest and capacities of businesses, chambers of industry and commerce, trade unions and migrant associations, Labour-INT promotes multi-layered integration paths, from arrival up to the workplace, passing through education, training and job placement. “For the ETUC, Labour-INT is not only a project. It is a piece of our strategy on migration and asylum . The trade union movement is aware that the arrival of new people in Europe ”.